Earlier this afternoon, I was standing at the municipal pier in Viña del Mar, taking photos of the beach and the adjoining condo construction. We’re nearing the peak of high season at Chile’s #1 resort and the crowds are beginning to show up. It’s not my first visit to this pier…by chance, I have a similar photo taken of the same beach in 2006. In fact, I’ve got a pretty good set of pictures from this area going back a few years. When you see the way the beachfront has been developing from then until now, it’s obvious that Viña del Mar continues to grow in popularity with second home buyers. Construction companies are working hard to keep pace with the demand, as new projects sprout like wildflowers along the shoreline heading north from the city. This is an active property market in a sought-after location with lots of opportunity. Viña del Mar achieved prominence as a city in the 1870s and came into its own as a resort in the 1920s. Today, it’s Chile’s most-popular seaside resort, drawing people from around the country as well as a large number of international visitors. The weather in Viña del Mar is fairly comfortable all year, thanks to the Pacific Ocean’s modifying influence on temperatures. The Humboldt Current keeps summertime temperatures cool, with the average January high coming in at just 76˚ (24˚C). In fact this week it’s barely gotten past 70. This is fairly cool, given that Viña del Mar at Christmastime is the southern hemisphere’s equivalent of Charleston, South Carolina in late-June. Winter is not bad either, with July (the coldest month) posting an average high of 60˚ (16˚C). The water however, is cold all year, thanks again to the Humboldt Current. The water temperature is only 60˚ this week—in early summer—which seems to be fine for little kids and those in wetsuits. Almost everyone else is sunning themselves on the sand rather than frolicking in the waves. Surfing is popular near here, with a few good surf breaks in the area. Air quality in Viña del Mar is super, with fresh sea breezes providing a crisp, clean feel to the air. Viña del Mar lies west-northwest of Santiago, and is fairly convenient to get to on the freeway. It’s just over two hours from my apartment near central Santiago (Providencia), an hour-and-a-half from western Santiago, and less than two hours from the international airport (SCL). If you like seafood and seaside dining, then this is the place to be. Fresh seafood and shellfish are the main culinary features here. But you’ll also find scores of coffee shops, Italian restaurants, sushi, Peruvian, and most anything else that you’d want. And at this time of year, sidewalk dining is popular, with many of the restaurants offering sidewalk tables under colorful umbrellas. Viña del Mar is a resort that’s actually adjacent to a “real” city. The beachfront area has most of the resort-style amenities, such as the highest concentration of restaurants, clubs, cafes, and the stately municipal casino. But just a few blocks inland, the rest of Viña del Mar completes a city of almost 300,000, which offers a full complement of city conveniences like shopping centers, theater, orchestra, and administrative services. What’s more, Valparaíso is just a few minutes away, offering even more big-city entertainment and services. One thing that stands out on this trip (compared to visits in 2002 and 2006) is the amount of English spoken today in Viña del Mar. Almost everywhere we went there was at least one English-speaking person who was anxious to practice on us. It’s far easier to get along in Spanish…but English-speakers will make their way more easily as a visitor, and probably survive as a resident. The city of Viña del Mar occupies a number of seaside hills and cliffs divided by the Marga Marga creek, with the north and south sections connected by a series of bridges. Generally speaking, the north side of the city contains most of the resort amenities and modern residential options, while the south side has the original town square, theater, older neighborhoods, and local markets. On the north side of town, things are again divided, by Avenida Libertad, a north-south road that divides the east and west sectors. Again speaking generally, the beach-oriented properties are on the west side, and the more-residential areas are on the east. Within the north side of the city, the neighborhoods are mostly mixed. You’ll find single family homes as well as apartments… and working class areas mixed with elegant second homes and condo towers. Public transit is plentiful throughout the city and surrounding area, including a metro train that runs to neighboring Valparaíso. And public transit is important, since parking here is a disaster. When shopping for property, make sure it comes with parking. Parking in the city (everywhere) has not kept up with the city’s growth and you don’t want to be the one left out. To the property buyer, the areas north of the city are just as important as Viña del Mar. Reñaca lies just north of Viña del Mar and, although separated by some undeveloped space, is part of Viña del Mar. Reñaca has a small, walkable town center with its own selection of restaurants and cafes. 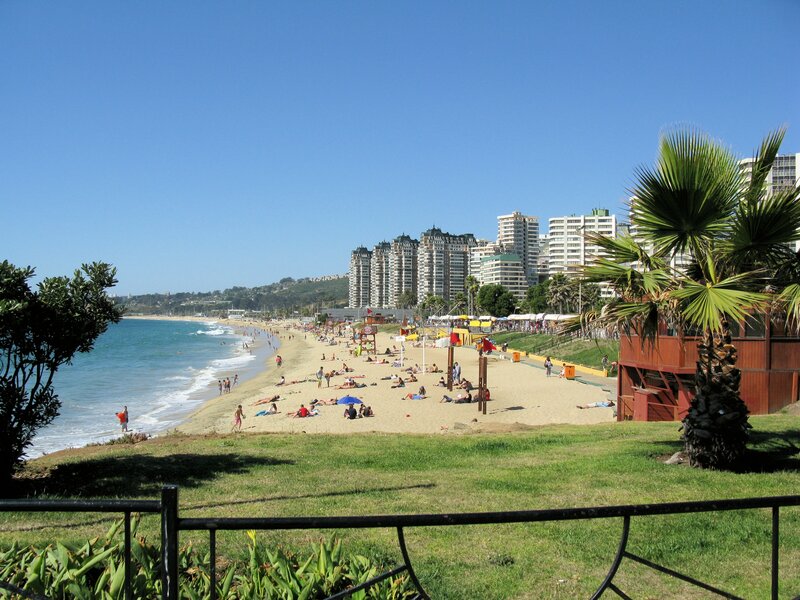 The beach here is as nice as those in Viña del Mar and it enjoys a popular surf break. Reñaca is where construction is booming—modern condos close the gap in development between Reñaca and the rest of Viña del Mar, while also creeping northward towards Concón. Concón is the next town north of Reñaca and, while perceived as part of the Viña del Mar metro area, it’s actually a separate municipality. It’s a small, mostly-residential seaside town, that’s just beginning to see the expansion of 21st century development. Most notably, it’s home to a protected marina housing a small fleet of large, recreational sailboats. I had lunch in Concón last Thursday at an old beachfront restaurant, watching the sea birds diving and the boats coming and going in the marina. The town still retains the feel of an old seashore town, with just a few signs of modern development at the beach and mostly single-family homes just inland. Viña del Mar is a mature market with an established real estate and rental infrastructure. Here you can pick from a large selection of existing properties in an area that has a long track record for market performance and rentals. Reñaca is in a boom phase right now, and it’s where you’d look for a good selection of brand-new properties and pre-construction deals. Concón is the next big thing coming up the coast, though I don’t know if its boom will happen next year, or five years down the road. Two types of buyers come to mind in Concón. One is the person that wants to enjoy the old fashioned seaside community as it exists now, the other is someone who wants to buy on the leading edge of future development. For example, there are a number of broken-down, old properties on the water that could be fixed up now…or held, as they will someday be sought-after by big condo developers. Here are a few examples in each area. Remember, these properties are officially listed in Chilean pesos and their dollar value will change with exchange rates. This two-bedroom, two-bath apartment in Viña del Mar has wonderful ocean views, as well as a terrace, underground parking, and storage. Located close to public transportation, the HOA fees are US$100 per month and the asking price is US$180,492 (CLP$110,821,950). Also in Viña del Mar, we saw a spacious 158 m2 apartment (1,700 square feet) with four bedrooms that each had its own fifth-floor ocean view…along with three bathrooms, parking, and storage. The apartment is located in the tranquil Recreo area of town and the asking price is US$195,440 (CLP$120,000,000). The HOA fee is US$129 per month. If a large single home, or potential B&B is more to your liking, a casona antigua is on the market in Viña del Mar, with 370 m2 of living area on three floors (3,981 square feet). The home includes eight bedrooms, lots of woodwork, three bathrooms, a parking area, back courtyard, and a front garden. The asking price is US$195,440 (CLP$120,000,000). In Reñaca, you can buy a spacious three-bedroom, two-bath apartment, with coastline views all the way to Valparaíso. With front and side terraces, all rooms have an ocean view. There are 140 m2 of living area in this property (1,506 square feet) for the asking price of US$260,710 (CLP$160,076,150). Also in Reñaca (back from the water) with views of the ocean from one balcony and rolling hills from another, this 102 m2 apartment (1,097 square feet) has two bedrooms and two baths, while the complex offers gym, clubhouse, sauna, two swimming pools, and nearly 7.5 acres of green space. The asking price is US$168,459 (CLP$103,433,820). In Concón, this apartment had my favorite view in the area (see photo below). It had a terrace offering an ocean view, plus a view of the yacht club…with two bedrooms, two baths, a large kitchen and living areas, parking for three cars, and storage. The asking price is of this 100 m2 property (1,076 square feet) is US$240,656 (CLP$147,762,600). Is Viña Del Mar For You? This is an energetic seaside resort, with mild temperatures, fresh sea breezes, and plenty to do. You’ve love the restaurants, cafes, bars and clubs, as well as the convenience of having a real city just a few blocks away. The real estate is of high quality construction, and the prices are reasonable. And best of all, Chile provides a First World setting with an excellent infrastructure, a stable economy, honest culture, low levels of corruption, low crime rates, and a high standard of living. If you don’t mind the chilly Pacific waters and the distance from the United States, then Viña del Mar may well be right for you. Happy Holidays to everyone from sunny Chile. Thank you so much for all the good information you provide! I read with interest your article on Cuenca Condos and homes. I understand that Ecuador charges a 5% “repatriation fee” on funds taken out of the country. This has made me hesitate seriously to consider investing there because that 5% could eat up a big chunk of any real estate profits. Presumably, one would also have to pay the 5% on any rental income that one received if not living in Ecuador and using the income there, in addition to an Ecuador income tax. Am I missing anything here? Could you please elaborate on this situation? A good point. The 5% Capital Outflow Tax is a fact of life in Ecuador. Called Impuesto a la Salida de Divisas in Spanish (ISD), it’s imposed on all outbound transfers in excess of US$1,000. And you can’t get around it by using companies like Western Union, because they’ll enforce it too. The only legal way around it is to transfer amounts under US$1,000 (the limit is two transfers per month), or to carry cash out of the country up to the legal limit of US$10,400 (the amount exempt from Ecuadorian Income Tax). When selling a property, it’s common practice to take payment for the property outside of Ecuador in order to avoid this tax. These rules can change. ISD has come and gone, and the amount has changed over the years. So it pays to double-check with the Ecuadorian tax authorities now and then, rather than depend on expat forums. Here’s the Ecuadorian government’s description of ISD, and the list of legal exemptions, both in Spanish. I will be visiting Nicaragua in January; can you recommend a real estate agent?